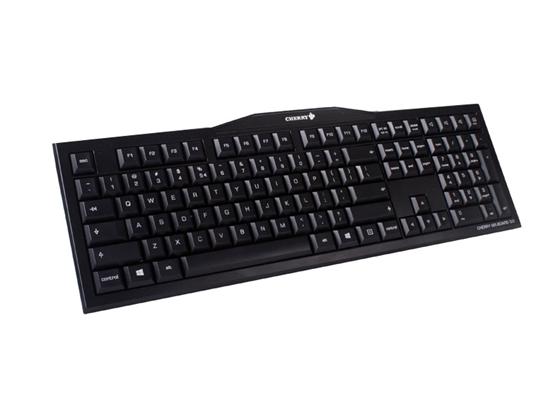 The Cherry MX-Board 3.0 keyboard is an ideal choice for moderate to heavy use for precise and fast input. Built with an integrated metal plate and anti-slip protection makes the MX 3.0 a perfect fit for all environments from rugged manufacturing to high traffic kiosks. The MX 3.0 is designed with world exclusive Cherry Gold Crosspoint technology and ships with a 2 year warranty. This is the little brother to the award winning MX Board 6.0, it has the same options when comes to having different types of mechanical keys to fit your personal preference, but it is a plastic body instead of metal making it a little less tough but still extremely precise and responsive. The detachable USB cable is a nice touch for people that like to take their keyboard to various pc's but don't want to unplug it from the back of the PC. Tested with a large variety of RTS, MMO, and FPS games. No inconsistencies between the keys, the space bar doesn't feel drastically different then the other keys. We didn't experience any squeaking or odd noises. Not really any double press issues where you accidentally press two keys due to bad spacing of the keys or poor tactile feedback. Find it faster! Click here to compare MX-Board 3.0 models by feature.